After Thanksgiving and all those leftovers, maybe you’re looking for something a little lighter. This is one of my favorites, a light lunch or breakfast that’s still filled with good for you things like avocados and eggs. Open Faced Avocado Miso Toast with a Fried Egg & Fresh Spinach. I like this on a pretty hearty wheaty bread. The bread in the photo is from Dave’s Killer Bread, and it’s really good. This is their “Good Seed” variety. 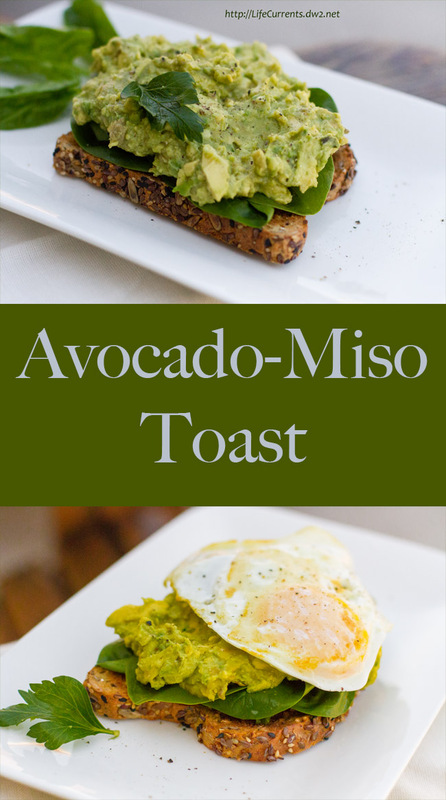 Open Faced Avocado Miso Toast — leave the egg off if desired, it’s still fantastic! Lay fresh spinach leaves on the toast. In a small bowl, mash the avocado and miso together with a fork, and spread on toast. Sprinkle salt and pepper over the avocado mash. Fry the egg to your liking, and top the avocado toast with the fried egg. Devour. YUM! This looks so amazing! Thanks for dropping it by the Favorite Things Party! I’ve never used miso in this type of application but I’ll bet its wonderful! Great idea!